Rubber Duckie & Friends bath and shower wands for kids make bath time Good Clean Fun! The soft, spray won't sting and is gentle enough to bathe infants and toddlers. Your kids will love the bath. 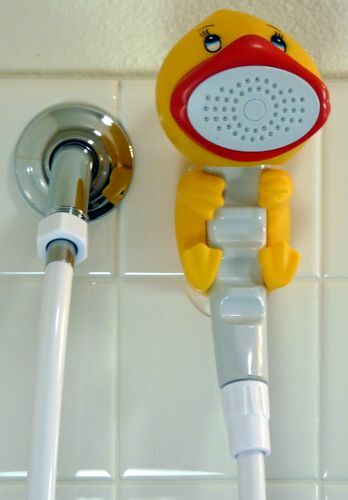 Then, as they grow Rubber Duckie & Friends become their first very-own shower head. Fun & adorable bath & shower wand for kids. - Soft 1.5 gpm spray pattern gentle enough for infants and toddlers. - Attaches easily to your current shower arm or included 2-way diverter. - Diverter switches water-flow from mom & dad's shower to kid's. - Extra-long 6-foot hose reaches back of any standard tub. - Rubber suction cups makes wand mount completely moveable. - Goes anywhere in the tub or shower. - Perfect for kids ages 6 months & older. - Makes a great baby shower gift. Note: This post may contain a sponsored/affiliate/referral link. Thank you for supporting this site! I will receive a free product in exchange for my review. Info was given thru USFamilyGuide.com. The Color run is Coming to Wichita Falls, TEXAS! !